John Doran, a Civil War soldier, served 12 years in the First U.S. Artillery. After being discharged, he struggled 21 years seeking an invalid pension (now called disability pension). 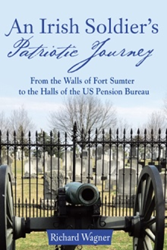 Richard Wagner’s new biography of John, entitled “An Irish Soldier’s Patriotic Journey: From the Walls of Fort Sumter to the Halls of the US Pension Bureau” (published by Archway Publishing) shares the story of his life both before and after the Civil War. John Doran, an Irish immigrant, traveled to America in 1857 to improve his lot in life, became a United States citizen and learned the trade of iron molding until he became restless and bored with the daily routine. In 1860, he enlisted in the First Regiment of the US Artillery and served from Fort Moultrie in Charleston, South Carolina, to Appomattox, Virginia, the declared end of the war in 1865. During his service, he earned promotions from private to sergeant, was twice wounded, faced malnutrition, near starvation, sleep deprivation, extreme fatigue and was stricken with numerous other medical infirmities – all in the line of duty. After his discharge in 1874, he returned to Meriden, Connecticut, his family, and iron molding until he was forced to abandon manual labor due to the pain from his wartime injuries. John spent years facing personal and bureaucratic obstacles while attempting to receive an invalid pension. After 10 years of applying, he was awarded a small stipend. Richard Wagner was born in Fayetteville, Pennsylvania, and attended Gettysburg College where he became interested in the Civil War. He earned a bachelor’s and master’s degree from Shippensburg College, taught high school social sciences for 37 years, retired and began writing. He has published a biography of Major General Samuel W. Crawford entitled “For Honor, Flag, and Family” and historical papers on Crawford and his family for Franklin County’s Kittochtinny Historical Society. During his research on Crawford, he found a note indicating the surgeon had treated John Doran at Fort Sumter for a crushed foot – the starter dough for “An Irish Soldier’s Patriotic Journey.” Wagner and his wife Karen currently reside in Chambersburg, Pennsylvania.